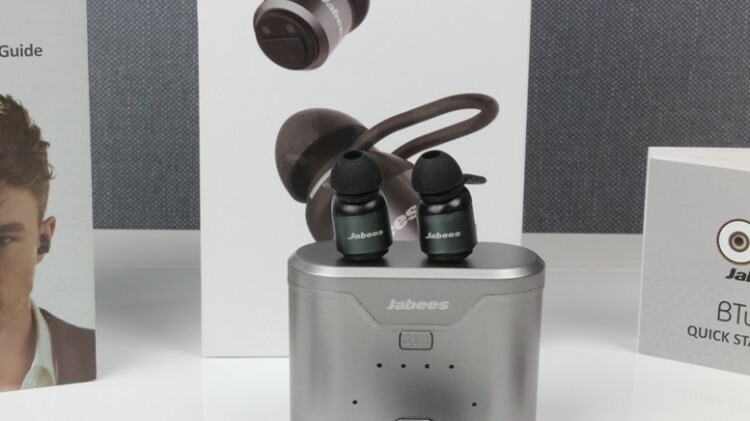 Home / Reviews / Audio Reviews / Jabees BTwins Earbuds – AirPods Killer? 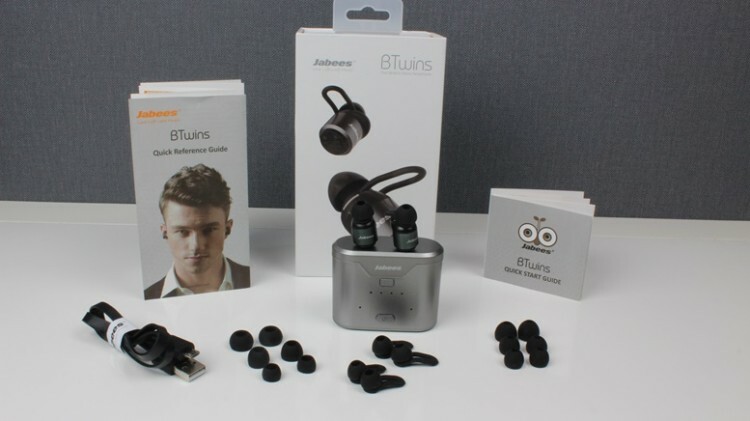 Jabees BTwins Earbuds – AirPods Killer? Jabees was a new brand to us here at MTT. We’d heard of them but hadn’t actually checked out any of their products before. So when Kavson approached us to review the Jabees BTwins earbuds prior to them going on sale on their store on 30th September, we jumped at the chance. Are these a good alternative to Apple’s AirPods at half the price – read on. The Jabees BTwins couldn’t have been released at a more opportune time. With the announcement of the Apple iPhone 7 devices and their lack of 3.5mm audio jack, Apple fanatics will be looking around for a good pair of wireless headphones that are cheaper than the AirPods that retail for £159.00, deliver an equal or better audio experience and perhaps a mite more stylish, although that will be a personal opinion. 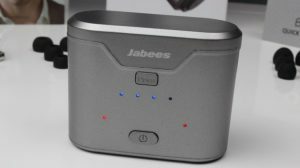 The Jabees BTwins certainly deliver the first part of the equation coming in at £79.99 from Kavson, which is quite a big difference when compared to Apple’s offering. Let’s deal with the value proposition of the Jabees BTwins first and foremost. You get a lot for your money in the box with accessories everywhere. So that’s 9 additional tips and fitting accessories as well as a Power Pouch which can be used to charge the units when mobile thanks to a built in 450 mAh battery and a belt clip. Very nifty indeed and something a little bit different to the usual unboxing experience. Pairing the Jabees BTwins is a slightly different prospect to usual Bluetooth IEMs. Each earbud has a power/multi-functional button and pressing them down for 3-5 seconds invokes an audible “pairing” indicator and the LED flashes red. Pairing to each other, and the phone is then simplistic and normal. Once paired, there is a quick and brief channel notification to make sure that the earbud is in the correct ear which is handy. However the earbud buttons are so small that pushing them in whilst in ear can be uncomfortable but that’s the only way you’re going to hear the audio announcement of channel which becomes required – there is no R/L channel indicator on the earbuds themselves. Once paired however the audio is…intriguing. At the low end they pack one hell of a punch. Not quite Beats-esque as there is more clarity here, but bass is certainly a large part of the soundstage here. It’s crisp enough and 90% of the time it doesn’t overpower the song, but if you’re a Hip-Hop fan (guilty as charged – Ed) then it can sometimes relegate the mids somewhat. Listening to an acoustic set or more vocal artist (Adele, Ed Sheeran, Sam Smith, John Legend etc) is, interestingly, fine. There’s a slight spatial effect that can be detected in these types of songs, and the bass is still evident, but there isn’t enough of it for the scales to be tipped, however the volume does need to be jacked up another couple of rungs in order to be delivering the same clarity as other genres. Making and receiving calls on these earbuds is almost a no go. Whilst hearing the caller is no issue, the embedded pinhole microphone is so far into the ear that the recipient has next to no chance of hearing you clearly. Unfortunate but a nice enough audio experience all round isn’t watered down by this. That experience will continue for some time as well with us managing to get a good 5 hours of playback without the need to re-charge these little troopers, which is a bit of a shame actually considering the wicked-good power pouch included. Any pause of more than 30 seconds on the playback device will see the earbuds give an audible indication of disconnection and they go into a sleep mode too to safeguard that valuable juice. There are a couple of areas which would be of consideration to those wishing to purchase such a product. Connectivity, as with all Bluetooth units (version 4.1 or otherwise), is sometimes hit and miss when the connected device is put into a pocket. 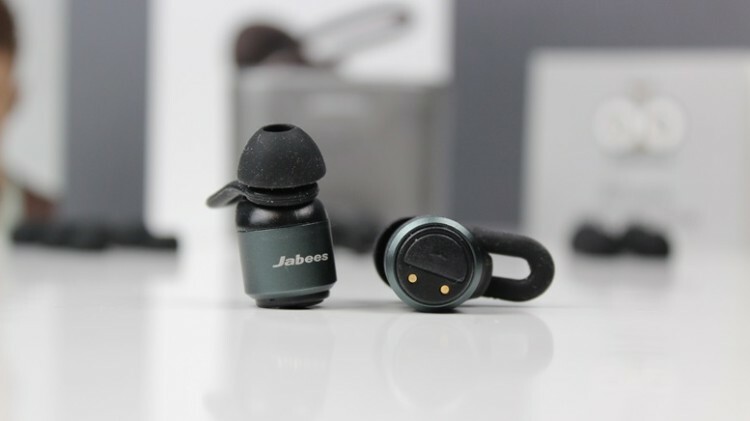 All of our Bluetooth headphones and buds have had the same issue to a lesser or greater degree, but the Jabees are a little more sensitive in our testing and we managed to engineer disconnections relatively frequently at only a 3 metre distance. Rather annoyingly the disconnection is less stutter and more split channels. Dropping a left channel for a few seconds, only to have it come back and continue playback, and then losing both channels for a split second only to have the music fade back in can be frustrating. It’s worth noting this is much more noticeable at a low battery level, which might be expected, but it’s not limited to that unfortunately. Given that these units are built for fitness and sports lovers, where a device is likely to be close by suggests that perhaps it wouldn’t cause too much distress but it’s worthy of note. A feature that we tested but had no real use for is also perhaps added value for some consumers. As these earbuds are independent they can be paired to two separate devices and playback two streams of audio which would be handy if you’re happy to hear your given tracks in mono. In a pinch, transforming your devices into two separate sets of earbuds is a cool, if seldom required feature. These are cool units. Testing completely independent earbuds is always going to be a cool experience and somehow feels very futuristic. Thankfully the audio playback of the Jabees BTwins is a similar experience to behold. Yes, they are slightly bass heavy, but it’s also crisp. The bass is not so overpowering that your ears are going to bleed, and the volume spectrum is sufficient to keep most consumers happy. 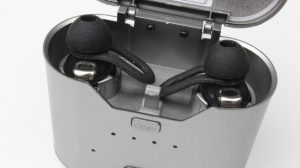 Battery life is acceptably good, and the inclusion of the different sized tips and accessories to aid comfort and fit puts other earbuds to shame, not to mention the awesome power pouch for mobile users, which after all is who this product is aimed at; sports enthusiasts and fitness fanatics. Sadly there are were enough issues with distance connectivity between each bud, as well as the playback device, to make them worthy of further investigation rather than an insta-buy product. They may well put the AirPods to shame in fit and finish, playback strength (to be put to the test) and overall value, but we know by now that Apple tend to deliver flawless hardware at the first time of asking, and we’re sure that connectivity won’;t be an issue as it sometimes is on the Jabees. So are these a worthy alternative to the AirPods? Currently, yes. They are 50% of the price for one, and they have the accessories to make them of better value. Plus, you know, they don’t look like a set of Pat Butcher earrings, so they’ve got that going for them too. If it wasn’t for that pesky connectivity we see on so many Bluetooth units, they’d be an absolute steal! Check them out over at the Kavson store and give them a go.